The colours shown on this website are available on a wide range of different boards. All our boards are made from engineered oak, with the exception of the walnut. This section gives you all the information you need to make an informed choice about the best style, grade, width and depth of board to suit your tastes and your space. We have done our best to configure Istoria in such a way that every decision lies in the hands of our customers, and are proud to offer a truly bespoke service. As part of that ideology, we are very happy to create new colours for you in our London workshop or source different boards upon request – just let us know what you are looking for! Istoria hardwood flooring is engineered. This means that each plank consists of a solid hardwood veneer set on a cross layer or multiply base. The veneer, which can range from 3mm to 6mm depending on the board that you choose, is a wear layer which determines how many times you can sand back the boards to recolour or repair them: 2-3 times on 4mm, 4-5 times on a 6mm wear layer. The advantage of engineered planks over solid planks is that they are much more stable and less prone to expansion and contraction due to the plywood construction. They are also suitable for use with underfloor heating. Along with a number of planks in different widths, we offer two parquet styles: herringbone and chevron. Parquet refers to patterned flooring, where smaller pieces of wood are laid in geometric formations for a decorative effect. It is a classic style that is currently experiencing a great revival – we especially like our larger herringbone parquet style which offers a modern twist on a traditional idea. We can also source Versailles panels in a range of patterns and finish them in Istoria colours upon request. We offer planks in three different grades of wood: Prime, Character and Rustic. The grade refers to the aesthetic appearance of the wood. All Istoria colours are available on a standard width 190mm board in any of the three grades detailed above, but also in our narrow boards (80mm, 125mm, 160mm) and our wide boards (220mm, 260mm) in Character grade. Both our herringbone and our chevron parquet come in two different sizes suitable for larger and smaller spaces. The standard depth of our engineered boards is 15mm, including a 4mm wear layer. This depth is perfectly sufficient for domestic settings and is ideal for use with underfloor heating. However, we also offer a deeper 21mm board with a 6mm wear layer for those looking for a structural quality board for any particular reason: see the table on page 6 for the dimensions of all our available boards. Istoria colours are made up of a number of processes, which predominantly consist of the application of oils and stains using several different methods. However, a few of these processes require further explanation as they affect the overall aesthetic of the board. These are detailed below. Please note that as wood is a natural material there is always some degree of colour variation between individual planks. We regard this as part of the unique beauty of hardwood flooring. We stock a large range of hardwood trims and accessories which can be coloured to match your Istoria wood flooring. These trims include door thresholds, radiator pipe collars, stair nosings, skirtings and many others. They come in various depths, lengths, thicknesses and styles to cater for your individual requirements. 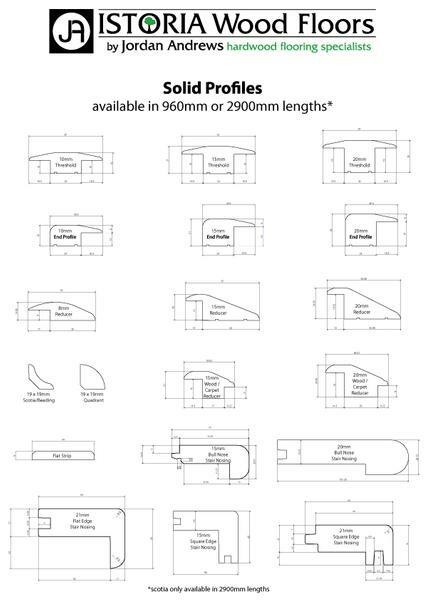 Please see the image below for the specifications of all our trims. 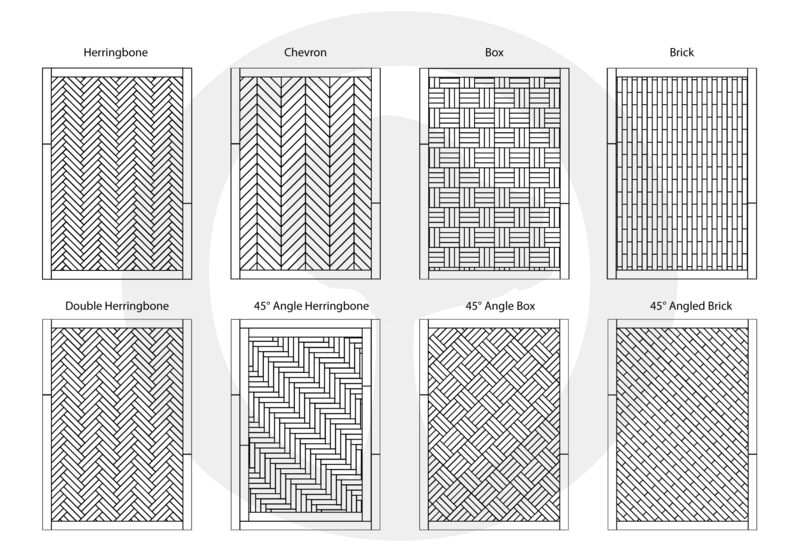 Below we have images of possible parquet laying patterns.